Thanks to our coverage of the problems PDFKit has faced in Sierra and High Sierra (see the article series “PDFKit Problems”), I occasionally hear from readers who are having troubles of one sort or another with PDFs. Most of the time, the problems are limited to a single corrupt PDF that might be viewable or printable with Acrobat Reader instead of Preview, but sometimes the concerns go deeper. TidBITS reader Chris Lee wrote to ask if I’d heard of issues with a PDF’s thumbnails rendering correctly, but each actual page showing as a single large black rectangle in the latest version of Preview under macOS 10.13.2 High Sierra. When he sent me the PDF, it opened and displayed fine in Preview on my Mac, running the same versions of macOS and Preview. Curious! Nothing I suggested made any difference, but after some more research, Chris reported back with the solution, which he found in a thread in the Apple Support Communities. In that discussion, which also revolved around Preview and High Sierra, the problematic PDFs had been scanned in Image Capture and opened fine on other Macs. The solution may have been simple, but it was far from obvious. User oakcan reported suffering from the same problem and resolved it by calibrating his display. Chris said that recalibrating the display worked for him too. To get started with that, open System Preferences > Displays > Color, and click the Calibrate button. 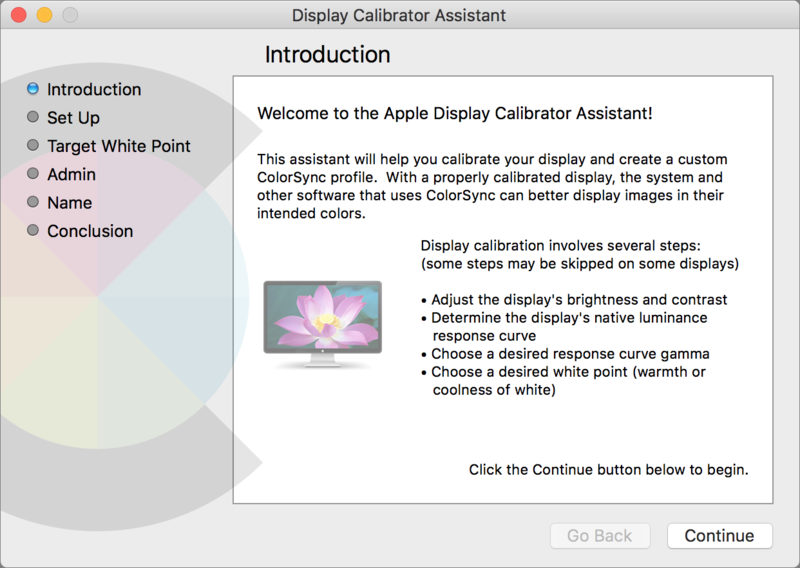 That opens Apple’s built-in Display Calibrator app, which provides an assistant-aided set of steps to calibrate your display — the specific steps may vary between displays. It’s hard to imagine what set of dependencies could cause a display profile to blow out the rendering of PDF pages, but not thumbnails. 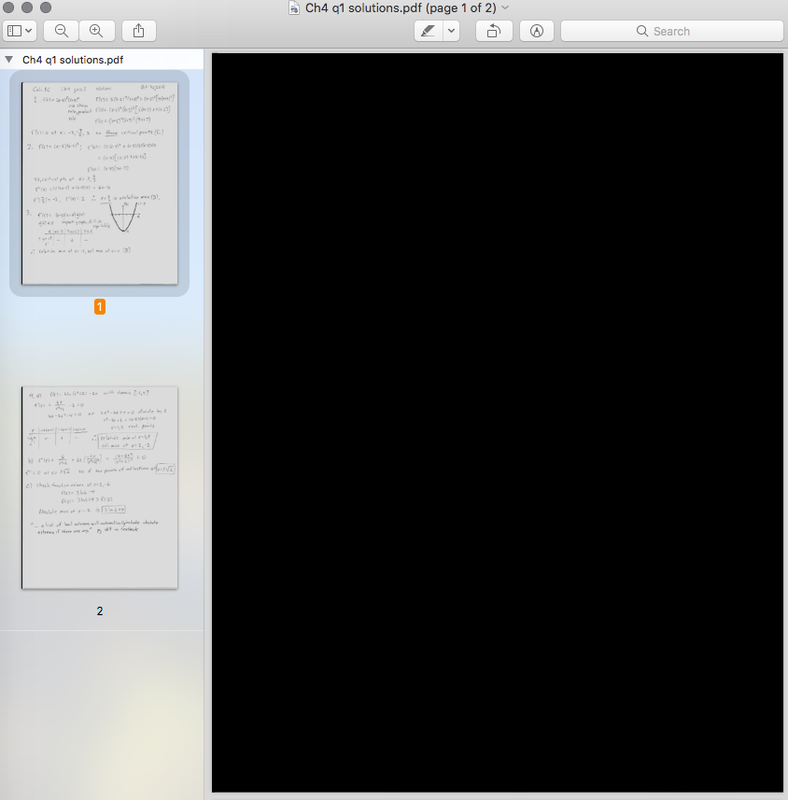 But there you have it — if you’re seeing black rectangles for PDF pages in Preview in High Sierra, try calibrating your display. I haven't seen this one before as far as I can remember. Far more often I get maintenance reports from service providers that purport to be PDFs, but simply don't register on a Mac or iDevice. The emails that deliver them can seem empty or are unresponsive. These pseudo PDF's are created by Adobe Acrobat and can only be read by its reader. What I do with these is reply along these lines: "Hi, Your email XYZ appears to be empty, is something amiss? Sent from my iPad." Then they'll tell me to install Adobe Acrobat and I'll ask them to send bog standard PDFs without frills, because it has to be readable on any device within our organisation without adaptation. Problem solved. Most of the time they are very surprised to learn that they were sending non-standard proprietary stuff. I'll bet that the PDFs they're creating are actually coming out of some system that has third-party PDF creation code baked in. Acrobat Reader is generally the best at being able to read any PDF, so these developers don't bother to test with Preview or other PDF readers and may be doing non-standard or even incorrect things without realizing. On my 17,1 iMac, the only calibration change I can make is white point. I have old profiles from previous Mac monitors still stored away, and they change the color of the 17,1 iMac screen, but there is no calibration color changing other than white point on the 17,1 iMac. Maybe I missed it. Not sure how this will effect the black pdf. I have seen the black boxes, when I save a website as a pdf, but it is only from one website so far. My take was that the specifics of the calibration were irrelevant; it was just important to do a calibration to reset the profile in some way. I've only seen black boxes saving websites containing videos. I've assumed it might have something to do with problems generating a screen snap out of a running video, or capturing the freeze-frame of a paused video created by the website, e.g., YouTube. Thoughts? I've seen something like this on and off in Preview for a number of versions of macOS. That and Preview doubling the file size of a document scanned in portrait format and then rotated to landscape and saved. Those and finding that Preview would occasionally convert a single rotated scanned image into a black rectangle, and refuse to undo the damage. I soon adopted the habit (learned first during battles with MS Word on an employer's PC) of always editing only copies of files, and finally bought PDFPen after TidBITS published comments about Apple's implementation of the PDF standard. Oh for the happy days of yore when one could regard Windows users with a certain smug condescension. Seems to me Preview has more problems than just the black pages. First and foremost, since at least Mac OS X 10.11, on opening any PDF, neither the down-arrow nor the pageDown key will scroll down a page. Clicking on the page 2 thumbnail resolves that problem thereafter. Bad Apple! Some documents, for example Moneydance’s manual PDF, don’t show preview pages after the first two, and the full-size pages are equally blank. Preview is unusable for these documents. Searching such documents, for example that Moneydance document, causes Preview to hang forever, requiring a force-quit. Preview is oblivious to whatever document errors or other conditions cause this behavior. Bad Apple! I'm in no way saying that you're not having these problems, but at least those I can test here are specific to your Mac, not Preview in general. The down arrow and Pay Down keys work fine, for instance. I don't have the Moneydance PDFs, but I'd bet that they'll work fine for most everyone else too. So the question is why you're having these problems. The most likely culprits are corrupted preferences files, so you might look at deleting those. You can test easily by creating a new user account (or just logging in as guest) and trying to open the same PDFs. It would also be interesting to see if the problems recur with a Safe Boot. It's not inconceivable the that the problem is deeper in your Mac, at which point you might have to consider reinstalling macOS from scratch.